Michael Ekundayo Akomolafe popularly known as “Dbass Dayo” is a Gospel Minister and a Bass Guitar maestro who hails from Ilesha in Osun State. The Obafemi Awolowo University graduate specializes in the genre of music which he calls GAJ Music: Gospel African Jazz music. The content of Dbass music is purely gospel and spiritual, this can be felt in the world standard GAJ hit tracks like “Meta Meta, Let’s Go” where he uses the bass guitar as a lead instrument to lead songs in worship and praise to his creator Jesus Christ. Roll call of artistes Dbass has served and worked with include: Lara George, Pannam Percy Paul, K’ore, Eric and Olumide Shobowale and many others. He has also featured at various events like the largest Gospel concert in West Africa ” The Experience” along side Lara George in 2009, Heritage Concert in South Africa, Ministered at the 70/71 hour praise organised to mark the birthday of Daddy E. Adeboye of the RCCG in 2012 and 2013 respectively. Dbass also plays with a Jazz Band called FANA ANSAMBLES in South Africa. 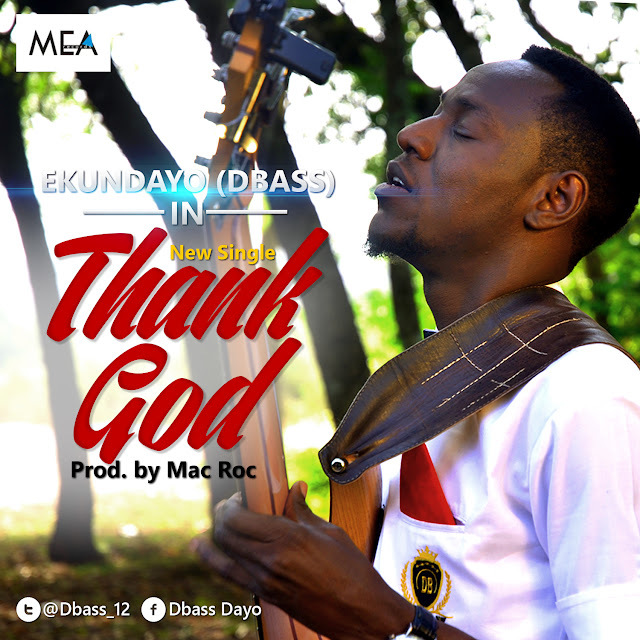 Thank God is a single off his new album to be released this Sunday [14/6/15] titled, “No Be Na God”. Dbass Dayo wrote: “Its exactly 5 years this month (June) that God brought me back to life after a fatal accident that took many lives along the Lagos/Ibadan Express way. I walked with crushes for over 3 months but here I am today full of life. It could only be God. Thank God is a song filled with words of gratitude to God for the gift of life”.